Birthplace : Humansville, Misouri, U.S.
Zoë Akins was an American playwright, poet, and author. Her first major dramatic work was Papa, written in 1914. The comedy failed, but she continued to write. She followed early failure with The Magical City and Declassée, two plays that were moderately successful. (Ethel Barrymore starred in Declassée.) Akins endured a dry spell throughout the 1920s. During this time several of her early plays were adapted for the screen. These adaptations were mostly failures, released as silent films in a time when the industry was transitioning to sound. While some "talkie" stars had notable roles in the films (Walter Pidgeon and a young Clark Gable), most of the films are now believed to be lost. Eventually, Akins found a small measure of fame with the play, The Greeks Had a Word For It, produced in 1930. The play about gold-digging women and the men they fool became the young playwright's first notable production. 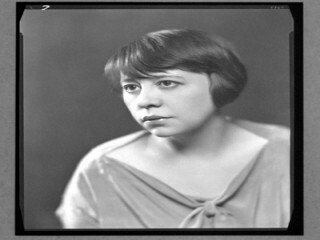 In the early 1930s, Akins became more active in film, writing several screenplays as well as licensing minor adaptations of her work—such as The Greeks Had a Word for It which was adapted twice, in 1932 (as The Greeks Had a Word for Them) and 1938 (as Three Blind Mice) -- neither was a hit. Two highlights of this period are the films Sarah and Son (1930) and Morning Glory (1933), the latter film remade as Stage Struck. While both films earned their respective female leads (Ruth Chatterton and Katharine Hepburn) Academy Award nominations, neither was enough to launch Akins' career. Finally, Akins received recognition. In 1935, she was received the Pulitzer Prize for Drama for her dramatization of Edith Wharton's The Old Maid, a melodrama set in New York City and written in five episodes stretching across time from 1839 to 1854. A film version of The Old Maid followed in 1939, starring Bette Davis. Akins also adapted the Alexandre Dumas novel, La dame aux camélias which was adapted into the film Camille in 1936. The film starred Greta Garbo, Robert Taylor, and Lionel Barrymore, and earned Garbo her third Oscar nomination. To Akins' surprise, she was thrust into notoriety again in 1953, when Jean Negulesco directed an adaptation of The Greeks Had a Word for It. The film, titled How to Marry a Millionaire, became a box office sensation and helped launch the career of its star, Marilyn Monroe. Monroe's role in the Akins' play helped the rising star become a cultural icon, and encouraged Akins to pursue a short stint as a writer for several television variety programs.